Greer's OC | Tonight: Two Parties—Fashion & Furniture! Tonight: Two Parties—Fashion & Furniture! 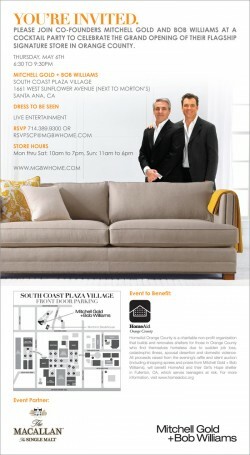 Tonight, you are invited to two fun fashion and furniture grand opening parties! You can also join co-founders Mitchell Gold and Bob Williams at a cocktail party from 6:30 to 9:30 p.m. to celebrate the grand opening of their flagship signature store at South Coast Plaza Village. All proceeds raised from the evening’s raffle and silent auction (including shopping sprees and prizes from Mitchell Gold + Bob Williams), will benefit HomeAid Orange County and their Girl’s Hope shelter in Fullerton, which serves teenagers at risk. Mitchell Gold + Bob Williams store at 1661 West Sunflower Ave. (Next to Morton’s) in Santa Ana.